What do you think of when you picture a superhero? If you’re like most Americans, the image that comes to mind is of the white, male comic book characters that have dominated the pop culture landscape for decades. The new documentary DRAWN TOGETHER: COMICS, DIVERSITY AND STEREOTYPES, a program that’s playing at CAAMFest36 with the Asian Art Museum, wants to change that. While comics are still often dismissed by the uninitiated as media that’s geared towards children, Singh uses her film to explore the long history of comic book artists redefining what it means to be an American during the best of times —and how comics were successfully used to spread harmful and racist images during the worst of time. Super Sikh creator Eileen Kaur Alden, K-Chronicles artist Keith Knight and Vishavjit Singh of Sikhtoons take the director through their creative process and inspirations while visiting conventions and talking to readers as they experience their characters. 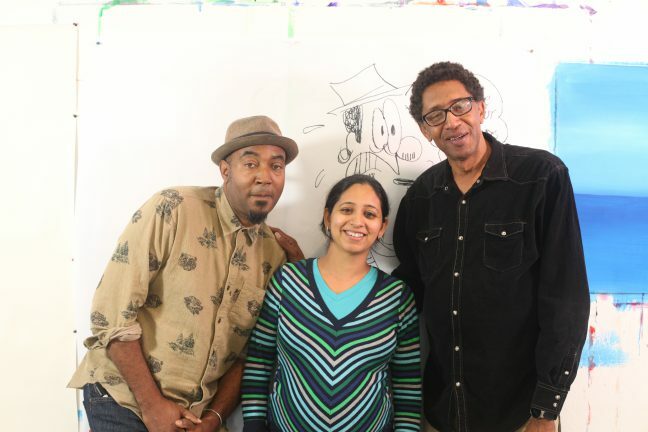 I talked to director Harleen Singh and all three cartoonists about working on the film, illustrating diverse cultures and more. Congrats on such an interesting and thought provoking film. I kept thinking about how all of you mentioned that how you devoured comics as kids, yet never saw your experiences reflected in the stories you read. Can you describe what it’s like when fans talk about what your work means to them? Harleen Singh: Growing up in India, I had taken diversity for granted. In the West, we have to make a conscious effort to nurture it. As cultural minorities, if we don’t tell our own stories, nobody else will. That’s why I look for commonalities and inspirational stories that advance the conversation on diversity and inclusion. My films usually provoke some thoughts and people tend to place themselves in the situation and reflect on their own behavior. That is exactly where change happens. Vishavjit Singh: I visit a lot of schools and do talks and presentations. As I travel to different schools and I meet brown kids, South Asian kids, Middle Eastern kids, Hispanic kids, and some of them do mention representation but I found that even the Caucasian kids all kind of respond to my cartoons because they haven’t seen turbans and beards represented in comic book media before. And then when I ask them to draw their own cartoons, even though I don’t ask them to, many of the kids choose to draw characters with turbans and beards, because it is all very fresh to them. 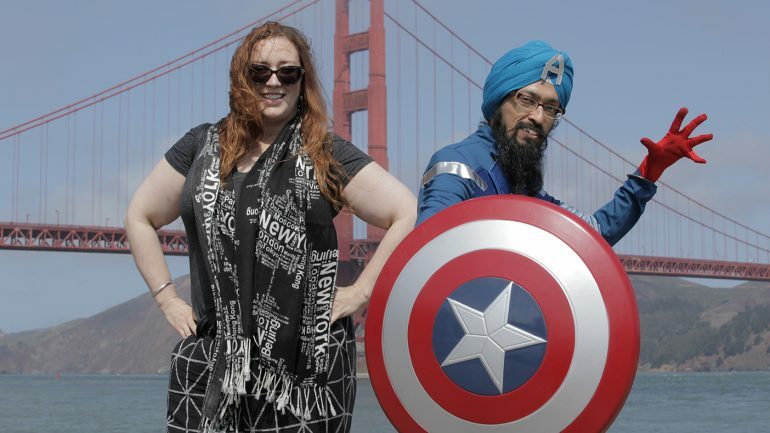 Eileen Kaur Alden: We interviewed a number of Punjabi Sikh kids in India before working on Super Sikh and we asked them who their favorite superhero was. Each of them gave a standard answer: Batman, Ironman, Superman, etc. Even the girls. Offering them Super Sikh comics has made them incredibly happy. I get looks of amazement, disbelief, and sheer joy. Keith Knight: I just had a dad who came up to me and say “How on earth did you manage to capture my experience so well? “ It’s amazing how the more personal I get with my work, the more universal it seems to be. I just know how I felt when i saw characters and creators that looked like me. How important it was. We all have stories to tell. We all deserve a chance to tell them. 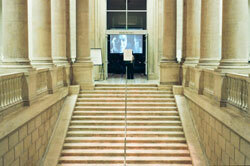 How do you feel about your film being a part of CAAMFest and as part of the Asian Art Museum? EKA: I think it is a perfect match. The film really speaks to the power of art to change hearts and minds. So I think of the CAAMFest and Asian Art Museum as being perfect partners for that message. HS: My documentary is set on a backdrop of comic art and it’s an honor to present the film at the Asian Art Museum, one of San Francisco’s premier arts institutions and home to a world-renowned collections of artifacts and treasures. 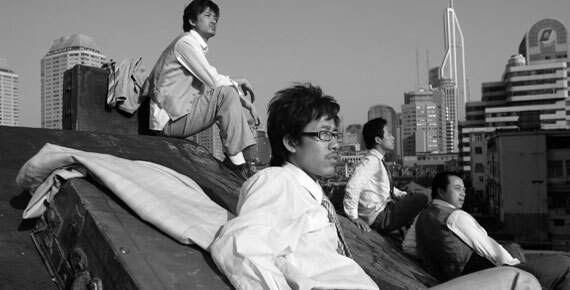 CAAMFest is a premier festival showcasing the work of Asian and Asian American artists. Its dedicated to sharing extraordinary stories that truly reflect the Asian American experience and reaches a wide audience. What characters or comics particularly resonated with you when you were a kid? How have they influenced the work that you do today? VS: I spent part of my childhood in India so I grew up with Archie and mostly European comics like TinTin and Asterix. I actually didn’t read a lot as a kid, my parents didn’t really encourage me to read and I didn’t grow up reading books, I only read them in school when I had to. But I read comics growing up and then after 9/11 I got back into them again. EKA: I read a lot of MAD magazine, so it was a lot of political commentary and satire. And silliness. Those things stuck with me. As far as superheroes I was inclined towards Wonder Woman and I remember role playing her with my friends as a kid. I was also a bit of a sci-fi nerd. I’m super excited about the new Wrinkle in Time movie because that was one of my favorite books as a kid. It seemed like comics just didn’t offer a lot to young girls in terms of characters and stories, but sci-fi did offer strong female protagonists and supporting characters. Later in college and as an adult I discovered alternative comics and authors like Will Eisner and Neil Gaiman and Art Spiegelman. That was where the stories diverged from the classic Marvel and DC superheroes, and that’s what really sparked my interest in comics and graphic novels. Harleen, can you tell us a little about how you got the idea for Drawn Together? The Kickstarter campaign you did in 2016 got a lot of attention. HS: As a woman, I have had my share of being stereotyped. The color of skin adds another layer and being a mother of two toddlers adds yet another layer of bias. My friends and family members also face prejudice and this has always bothered me. The project started with a conversation on stereotypes with Eileen over a cup of coffee. As I researched, I got to know more about Keith and Vish’s work. It wasn’t apparent initially how to interweave their stories together, but having their support helped me go way beyond the fuzzy outline I initially had. I wanted to bring this issue to the forefront through positive inspirational stories of people who have challenged stereotypes, bigotry and racism against all odds. Comics, with their humor, have been a fantastic way to educate people and help them become more socially conscious. I chose this medium for this unconventional topic in order to engage the audience and hopefully make them act. This year obviously saw the opening of Black Panther, which is set to become the highest grossing superhero movie of all time. What does the audience response and conversation around Black Panther tell us about the need for heroes that break the stereotypical mold (particularly when it comes to the African American experience)? HS: Black Panther is an overnight success that has been 52 years in the making. The audience response indicates that there is an unsatiated appetite for superheroes that go beyond the cape and the mask and appeal to the values embodied by the superheroes themselves. T’Challa is an intelligent, inspirational figure, rooted in humility. Today’s audience is diverse, they are hungry for change, accepting of new ideas and will respond to excellence no matter the color of the skin of the superhero or the cast. It also tells us that the audience loves to see strong, powerful women in consequential roles. Without Ramonda, Nakia, Okay and Share, the Black Panther would not be a star. So, in many ways the film breaks stereotypes associated with superheroes and the role of women while celebrating African culture from a perspective never seen before. EKA: I think the audience reception is like a big vindication for all those Hollywood producers who have dismissed the diverse audience. Hollywood has been showing data that points to diverse audiences being really powerful and they have willfully ignored it and refused to accept the idea that a different kind of story, cast, and crew can be successful, in spite of all the data they had. Now we have finally reached the tipping point and the reality can no longer be ignored. VS: I think that Black Panther is going to create a new generation that are going to cross racial and gender lines in their stories.There have always been African American creators, but we haven’t seen a mega production like this before. I hope that this is going to open up the potential for more African American stories. KK: It’s just nice to see a big budget film where you can clearly see the powers that be let Black people do their thing. From the costume design, to the music, to the directing and writing. The door is open right now. We’ll see how long that will last. At one point in the film, a white comic book customer says something about how he’d never really thought about the Sikh American experience before picking up an issue of Super Sikh. Eileen, can you say a little about what it has been like talking to comics fans who are discovering your work (and perhaps reading about diverse experiences) for the first time? EKA: While writing the comic, I like to talk about “unpacking” characters. And what I mean by that is I like to play with the idea that you initially meet a character the same way you’d meet a real person and you really don’t know anything about them yet. So instead of doing a deep origin story where you learn everything about each character before the adventure begins, I like to let the audience learn more and more about them as the story evolves. When people first see a Sikh on the cover of the comic in an action pose, they don’t know what to think. They may be curious if they don’t know anything about the Sikh experience. Then they read the tagline “Loves Elvis, hates bad guys.” Now they know a little bit – maybe he is relatable. He’s an Elvis fan. Maybe he’s quirky. And he hates bad guys – so he’s one of the good guys. And it goes on like that as they find out more and more. While the dominant conversation around comics revolve around the Marvel and DC universes, the world of independent comics is incredibly diverse, as we see in the film. Can you talk about how the independent comic community has changed over the last decade or so? VS: Beyond the world of the big publishers, comic books are incredibly diverse. I go to a lot of comic cons and over the years they are increasingly diverse in terms of stories about people of color and LGBT stories. And I would like to believe that Marvel and DC are scouting these creators. Hopefully they’ll find this diverse market that is increasing every year. EKA: It’s been a tough battle as Marvel and DC have locked into Hollywood and celebrity culture. There is big money invested in seeing these comic franchises succeed at all costs. Meanwhile, the indie comics struggle to get shelf space because there is only one comic distributor, Diamond, who has a monopoly on comic store distribution. So all this adds up to a huge disadvantage that indie comic creators have on their hands to just survive and be seen. It’s brutal out there for Indie creators. KK: I think the past decade has given rise to an amazing group of women creators working outside the superhero genre. Web and magazine cartoonists. The tween book market. Graphic Novels. And there are a lot more ways to build audiences and support via websites like Patreon, which enables folks to support one’s work via art patronage. I’ve rebuilt my career after the demise of print by cultivating an amazing, and wonderful group of supporters. And here’s the thing..The crappiest, most milquetoast music is generally the easiest to find, right? It’s on all the pop radio stations and TV and all. And the most interesting stuff, you gotta search for…dig in the crates for. It’s the same for comics. Readers have to do some digging in the crates to find out of the way, interesting stuff. I know my work isn’t easy to find, but I hope it’s worth searching for. Another common theme in the film is that all of you mentioned that your parents were very, very nervous when you told them you decided to pursue a career in art. What advice do you have for both parents and kids who want to make this career jump? HS: At the Los Angeles premiere of my first film, an elderly man stood up and had tears in his eyes. He said that had he watched the film 20 years ago, he would have encouraged his children to pursue their talents. That incident has stayed with me. It is important for kids to make an informed career choice whether in the arts or elsewhere. There is a need for people to be able to tell their own unique stories. In the absence of storytelling, there is a vacuum in which every issue dies down. Arts are just a medium for telling the story whether it is through films, podcasts, paintings or any other new digital media format. And art today requires a lot of research that helps develop transferable skills. If kids show some early talent, parents should be supportive. KK: You only have one life to live, why not live it in pursuit of something you love? Folks I grew up with always say to me, ”you stuck with it..you stayed with it..” I couldn’t think of not sticking with it. Vishavjit, you’ve talked and written a lot about how the way people looked that you changed almost immediately after 9/11. How has your decision to dress up as “Sikh Captain America” changed the way you view the original character and the conversations you are having with people? So I thought, ‘Maybe I should teach myself to do cartooning and in 2002 I started sikhtoons.com. I don’t think I’d be a cartoonist if the Internet didn’t exist or at least, I would never have an audience without the Internet. Keith, I was really struck by your quote about how your intention with K-Chronicles was “to make a commentary on race without making a commentary on race.” Can you talk about how drawing depictions of ordinary Black life is in many ways revolutionary? KK: Frankly, just the act of doing an autobiographical comic where I can express my own perspectives and opinions and successes and failures is revolutionary in some ways. Again, Black Life has always been seen through a white filter, so when I do anything that does not fit that stereotype folks are used to, readers see it as something refreshing and different. But really, society is just starving for us to tell our own stories. That’s it, more than anything else. Eileen, you say in the film that you actually did not know much about the Sikh religion or culture when you first began developing the concept of Super Sikh. What advice do you have for people writing and drawing cultures that they do not have direct experience with? EKA: Great question! First, you have to partner with people who have lived this experience and are closer to it than you could ever be. And choose wisely and with a lot of gratitude and humility and make sure they have a good sense of humor, because you have to really listen to them as true partners not just research sources. After you find them, you have to make sure they don’t have to do all the work for you. You have to do your own homework and bring knowledge to the table. Read authentic stories from people who have lived in that culture. Find the definitions of things you don’t understand. Work hard at it. And then go get some early feedback from a few other people in the culture. Even if it is painful to revise over and over and get the details right, you are going to have to recognize you are carrying a big responsibility and your work is deeply personal to people you don’t know. You have to give their experiences the respect they deserve. Then after everything, some people will hate it. But when the haters come out and their disappointment happens, you can’t go back and turn your story into a different story for each of those hating people who wished your character was from Canada, or wished he liked a different type of music, or wish he embarked on a different journey or whatever they think is wrong with your story. Instead, you have to go out and support all the up-and-coming creators in that culture who have their own imagination and their own stories to tell. In the film, one of the interviewees mentions that the stories and illustrations seen by children are often remembered for the rest of their lives How do comics and their creators reflect the world around them? EKA: I think each creator has their own lens through which they see the world. When you put your creative ideas out there in a comic book for kids to see, you may be planting seeds that take them far beyond their own life experience. Kids are incredibly open-minded. Their minds are like an incredibly fertile imagination field, where the seeds of possibility can grow.